We can organize our contributions and work more efficiently to reach everyone by creating a comprehensive model that draws together existing solutions to embrace the full scope of the world, a model that continues to incorporate new solutions evolving from the best of our capabilities. When and how do we include our youth in the search for answers to our large-scale challenges? When and how do we begin an educational process that helps them address the varied, complex needs in our world? Adults often refer to children as the hope of the world, but if our youth are to make large-scale, needful changes, we need to assess our success in educating them to solve problems at this level in the real world. Logic will eventually turn us to the earliest developmental and foundational period of growth. Our children are part of “the people.” Our children have suggested and created outstanding service models at home as well as abroad. They are the next generation and will create the future for those who follow. If we hesitate to include our children in collective problem solving, we should consider the high value that gangs—or the global equivalent, terrorists—find in collecting our youth for violent and destructive activity. These groups recognize and capitalize on the desire of youth to become part of a larger community and purpose. We can create a conversely focused structure for our youth based on constructive values of peace, productivity, and caring for others and the environment. What would it be like if all our children regularly engaged in community service? How powerful would their contributions be if they communicated with their peers nationwide at the same grade levels and worked on replicable models of service in their communities? What would it be like for all communities to engage simultaneously in outstanding project models, helping those in need and restoring the environment? What would happen if we looked to our children for solutions and respected the support they bring to our world? What would we see if we consistently looked through the lens of our children’s vision? How would they feel about their education and their place in the world? How would project originators feel to see their work spun out nationwide and worldwide? How would a generation of adults interact, having grown together in making the world a better place, with quantifiable results and well-established working relationships? What would it be like if every school district had a sister-city relationship in a developing area of the world? What if all community members knew that schools managed a checklist of community projects with specific project information? What would our standing in the world be if we set the standard for working together to create lasting change, honoring future generations of adults in their formative stages of growth—if we became the central axis for information and collective work worldwide, with all our children at the helm? Could we sustain this? Absolutely! Americans are perfectly suited for this megachange. We have always been able to see the possibilities and create a future that embraces many from diverse backgrounds. Our schools are the perfect sustainable vehicle for staffing this change at home and abroad. We simply need to reorganize our problem-solving methods and transition into a new realm of history for the human race. A K–12 service learning curriculum, implemented nationally, would add a critical developmental component to the Serve America Act (www.nationalservice.gov), addressing community needs while developing civic competencies—beginning in the youngest grade levels. The K–12 model also establishes participation in the global community through interaction with, and support of, sister cities. Accumulated outcomes would create new and relevant validity for the time students spend in school every day, every year. Our children would have evidence that education is valuable and that they are valuable. They would be linked with adults and peers nationwide and globally, all working and achieving “on the same page” to make the world a better place. They would enter our communities as adults with problem-solving experience and know how to make a difference in ongoing ways, with action-based cooperative problem solving as a way of life. Students who have progressed through a sequence of service learning projects that were not simply units of study but leadership responsibilities spanning every year bring different expectations, skills, and energy to middle school. They and the larger community come to see the elementary grade school years as the foundation on which everything builds. Kindergarten teachers in our community identified animals as the starting point for a community leadership role. Kindergartners learn leadership and giving by collecting items for animal care throughout the year. The goal, as with all service learning projects, is to develop an ongoing, long-term relationship with the community-based organization, in this case, an animal shelter. After a visit with animal shelter staff, the leadership role for kindergartners begins with monthly communication with the animal shelter to obtain a list of needed items. Students inform the community and gather supplies. Sustaining the project throughout the year and from year to year educates all students and community members that kindergartners are managing these needed donations. Instead of an annual drive for items that can overwhelm community-based organizations and leave them without help at other times, an ongoing relationship continues from month to month, providing a steady stream of awareness as well as support. With a service learning model in place nationwide, kindergartners would lay a foundation for shared work and communication with their peers from all parts of the country. They would build relationships with their peers, sharing what they are learning, refining best practices, and combining their community contribution statistics to create national outcomes. They would also begin to experience from early on their value in the community, the support education brings to their ability to engage and contribute, and the support they can bring to one another as they meet the needs of our animal shelters, together, nationwide. Animal shelter representatives speak with students about dog safety, kindness to animals, and the role of the shelter in the community. Students learn about the work of veterinarians in their community. They read fiction and nonfiction books about dogs and cats. Students request a “wish list” of needed items from the animal shelter each month and work to gather the needed items, which typically include food, blankets, or worn-out towels, collars, leashes, and cleaning supplies. They update the community checklist with this information and manage donations for delivery to the shelter. They also make dog biscuits and catnip toys for animals in the shelter. Group discussion along with drawing and story writing allow students to express what they have learned about animals, how to care for them, and how the community can support the work of the animal shelter. Graphing activities include picture graphs of pets students have at home, a Venn diagram to compare and contrast differences and similarities between cats and dogs, and a graph to track donated items. Students contact and inform news media of the project. A flyer is created for parents and the community to learn about the outcomes of the project, inviting them to a school-wide assembly during which the project and its results are presented. The event could be scheduled during Be Kind to Animals Week in May. A project for first graders was the next consideration for a K–12 service learning sequence. The main criteria were curriculum and genuine community need. Teachers suggested a project with hospitals, since first graders already visit with hospital staff as part of a health unit of study. I had a number of service projects in my database collection under the topic of hospitals; however, when I contacted our hospital, emergency room nurses requested “hospital dolls.” Unsure of what these were, I searched online and found the “hospital dolls” that Kiwanis of Burnside, Australia, had created. With a match between curriculum and community need, we also discovered that our first graders were the perfect age to understand this need. We found hospitals in Maryland, Tennessee, Michigan, Pennsylvania, and California that used such dolls. With instructions from Kiwanis and additional information from the hospitals, we created a service learning project for first graders. Our emergency room nurses were enthusiastic about our taking on this project. The premise for the dolls is that a hospital experience can be an overwhelming experience for a child. Any injury that sends a child to the emergency room is aggravated by bright lights, strange noises, unfamiliar equipment, and strangers who take away clothes and poke and prod; a child hurts and has no sense of control, but a hospital doll can comfort them. The dolls are blank—they have no facial features. The children get a pen or a nontoxic permanent marker to draw faces on their dolls, which allows them to express their feelings and personalize the dolls—a pleasant and distracting activity. The purpose of the dolls, however, is more far-reaching. The doll is less threatening as a form of communication for young children who may be fearful of or resistant to treatment. Children who may initially be uncooperative or uncommunicative start relaxing and engaging with hospital staff when they have one of these dolls. The child can mark the area of injury and the pain they feel and can more easily share feelings and concerns through the doll, which helps staff make assessments. As staff develop rapport with a child, they can use the doll to explain procedures and help prepare the child for a treatment or test. Staff can use the doll to show where they will be giving injections or a posture or a desired body position they want the child to assume. Children become more cooperative and cope more effectively with the doll as a source of comfort. After treatment, children can dress the dolls and take them home. First graders visit with hospital staff to learn about health, routine examinations, and equipment used. They also learn how staffers use the dolls and the value of this contribution. First graders were old enough to understand the purpose of the dolls and to stuff them, but they were not old enough to sew them. The construction of the dolls involves simple cutting and sewing around edges with curves. The opening for stuffing needs to allow for first graders to stuff the doll with ease, and it is important to stay on the pattern, as misshapen dolls are hard to use at the hospital. After first graders stuff the dolls, the openings need to be sewn up. Hospital gowns with arms and Velcro at the neck can also be made from donated scraps. Our high school Family Career and Community Leaders of America (FCCLA) students took on this sewing task with this response: “We are looking forward to direct involvement with the first graders and definitely want to be involved with the first graders when it is time to stuff the dolls.” These high school students were excited to have a reason to work with first graders on a community service project, and the first graders were excited to have the high school students come to their class with the dolls for them to stuff and dress. Creating partnerships and working together was clearly enriching for both groups. In the absence of such a connection, another possibility for this support task could be community members who sew. An after-school program could serve as an alternate location for sewing the dolls. First graders stuff the dolls, starting with the head, then arms and legs, chest last. Dolls should be plump but not stiff so the dolls can bend although not flop. Original instructions included chopsticks to stuff the dolls, but our first graders were able to stuff the dolls better with just their fingers. When the dolls were completed, first graders dressed the dolls. Monthly communications with the hospital keep first graders updated on the need for more dolls, mirroring the sustained relationship first graders had with the animal shelter in kindergarten. This is typically a written activity after discussion about the purpose and significance of the contribution. At a school-wide assembly, a representative from the hospital shares project outcomes and first graders share reflection excerpts. Newspaper articles and radio station spots inform the community of the event. In less than a month, the first delivery of dolls to the hospital from one class was almost gone. Our hospital provided us with the number of children who would benefit from the dolls annually. In our community, 450 children between the ages of one and eight go through the emergency room each year. This kind of information allows for planning that spans the entire year, with monthly updates from the hospital. In addition to providing hospital dolls as their signature project, first graders also serve as the liaison between monthly requests from the hospital and donations from the community. Hospitals gain a reliable community contact, duplication of more well-known needs is reduced, and the variety of support increases. Over time, community members come to know that first graders manage this connection, honoring the work of these young but capable youth, and contributing to hospitals and also to the education or our youth. The elementary teachers with whom I worked were not necessarily service learning advocates, but they expressed interest in service projects for their students. Having become a service learning advocate wanting to create a sequence of projects in elementary grades, I served as a facilitator between teachers with service interests and community organizations. A second-grade teacher in one of our elementary schools asked for help with a service project of gathering items for a toiletry drive for our Violence Intervention Program (VIP) safe house. As facilitator, I initiated conversation with VIP staff, looking for a service learning connection. The suggestion of toiletry items met with a positive response from VIP staff. However, I knew from other project work, that this was offering a solution before asking them for their needs, so I asked staff for other possible areas that could also become the focus of the project. After some discussion, a staff member shared that VIP routinely received toiletry items from a variety of community members and organizations. She described the children who arrive at the safe house with nothing more than the clothes on their backs and maybe a favorite blanket. The toys at the safe house were communal, so the children had few if any personal possessions. We came up with a preliminary plan to make bags filled with age- and gender-appropriate things for the children at the safe house. The second-grade teacher realized the educational value this new project focus could bring to her students. Service learning tends to have an infectious quality those involved in service learning know well. The second-grade teacher’s enthusiasm spilled over beyond her classroom as she reached out to a middle school home and careers teacher, seeing a point of curricular convergence. The middle school teacher mirrored her enthusiasm, suggesting that her students could make drawstring bags for their sewing unit, and she personally contributed the fabric for the project. As teachers come together to work on a genuine community need, ideas flow and converge, increasing involvement and the educational value for our youth. The two teachers created a plan that would bring the grade school class to the middle school, where they would work together to fill the bags. They wanted their students to make a card for each bag with a handprint of the middle school and the elementary school students involved to add a personal touch. The educator for VIP was particularly pleased. This service learning project created the opportunity for her to visit with students of differing ages and brought a unique focus to her work with them. Service learning provided students with a point of personal engagement and contribution beyond a purely informational encounter with the educator about the work of the VIP in our community. We were weaving an integrated web of service and learning among students and community-based organizations that was inspirationally engaging for everyone. The educator from VIP visits the second-grade classes to share the purpose of the safe house and the need for items for the children and teens who leave their homes quickly and with very few personal belongings. Together with the educator, the students brainstorm possible items for the bags, thinking of a child their age or an older brother or sister. The number of children in the safe house over the past year is broken down by age and gender. Second graders choose specific children by age and gender for each bag they will create. A list of contents on the outside of each bag allows safe house staff to quickly assess its contents and remove anything inappropriate for a specific child. A letter goes home to students’ parents, describing the project and offering them the opportunity to donate items students have identified for the project. The educator for VIP also visits the middle school home and careers classes, sharing services provided for clients and how collaborative work creates a support system. Students then receive instruction on how to make drawstring bags. Students measure, cut out, and sew colorful fabric drawstring bags. Second graders fill the drawstring bags, and middle school students list the items in each bag. Together, students create cards that include their handprints. The second- and eighth-grade teachers engage their students in reflective dialogue about the project and their participation. Students write about their contribution to the project as well as how the children at the safe house might feel when they receive the gift bags. The educator from VIP shares the project from the organization’s perspective, and students share reflection excerpts at a school-wide assembly. The community learns of the event via newspaper articles and radio spots. An added bonus for VIP is that this event is another quantifiable educational encounter, which helps the organization qualify for state and federal program funding. The second-grade teacher who had piloted the project changed grades the following year to teach kindergarten. One day she came running down the hall to tell me a kindergartner who had been living at the safe house had come for show and tell with one of the bags. This teacher told me with tears in her eyes that the project had been meaningful at the time with her second graders but had really hit home when this kindergartner came to class with one of the bags. What was possible one year for us was not possible the following year, when budget cuts made it impossible for middle school and second graders to meet. Our teachers adapted with immediacy: fifth- and sixth-grade “buddies” assisted the second graders in the shopping process and creating lists for the bags as second graders filled the drawstring bags again created by the middle schoolers. Adaptations are enriching; and many more would be shared among teachers and students nationwide. The goal is to maintain the essence of a signature project at each grade level while also providing a cohesive point of civic engagement for youth on a national level. As in earlier grades, second graders have a signature project that addresses a specific need related to shelter as a safe haven. Their new leadership role focuses more broadly on all shelters in their community. As the contact point between shelters and community members, they provide monthly updates to the community checklist. In this leadership role, they become educated about the ways communities work to provide shelter for those in need. Is it possible that youth in developed nations and youth in developing areas of the world could come together with purpose? Could they help to restructure our world toward productivity, respect, and peace? Can community-based leadership roles inspire our youth to take an active role in shaping the society they will live in as adults? Can we give them this opportunity? Any research into the outcomes of service learning to date will head us toward a resounding yes as a response to these questions. Have we, to date, explored this possibility? Not on a large scale. What if every community had a sister-city service learning project? What if global solution-bearing project models were on a checklist for not only our children to study but for actual use based on the needs of their specific sister city? How would our children feel if they were able to work with peers nationwide, combining their global outcomes with a larger picture of global progression, humanitarian and environmental? How would international relations play out over time if our children learned to communicate effectively with others from different backgrounds? Learning from project originators who model the process of listening first and then creating solutions that over time become fully sustainable by the sister city, how would our children feel as they grew into adulthood, having worked together to help one another? What would our world standing look like if this took place? Is it possible that being an American might take on new significance that would bind us together in positive momentum? Our children’s knowledge of geography alone would spike because of relevance created among themselves; they would see their contributions in the larger scope of an ever-changing world—one in which they have direct influence. If every school district had a sister-city relationship, we would lay an incredibly strong foundation for productive, peaceful, global relationships as youth grow. We are smarter and more compassionate than our current world conditions indicate; we can do better. A simple and actionable sister-city component in a K–12 service learning model provides a way to accomplish more. We owe this to the next generation because we—the current generation—can do so. Worldwide organizations create partnerships between areas of need and those who can help. They also sustain communications, track outcomes, and seek support from the general population. A national K–12 service learning office would work with these organizations to set up sister cities with trustworthy project managers. Project originators and project managers around the world demonstrate it is possible to successfully navigate local politics, processes, and cultural traditions. They work to determine whom to contact, how best to obtain supplies, and how to get genuine buy-in from locals. A sister-city service learning project as a component of a national K–12 model is comprehensive, long-term, and developmental, and it has the potential to address multiple areas of need over time. This kind of dependable, ongoing support is a perfect match with the ongoing, sustained, committed work of project originators and organizations working with them to replicate long-term solutions where similar needs exist. Over the past eleven years, in addition to project models in the United States, I have gathered global projects from print and online sources and organized them by topic. 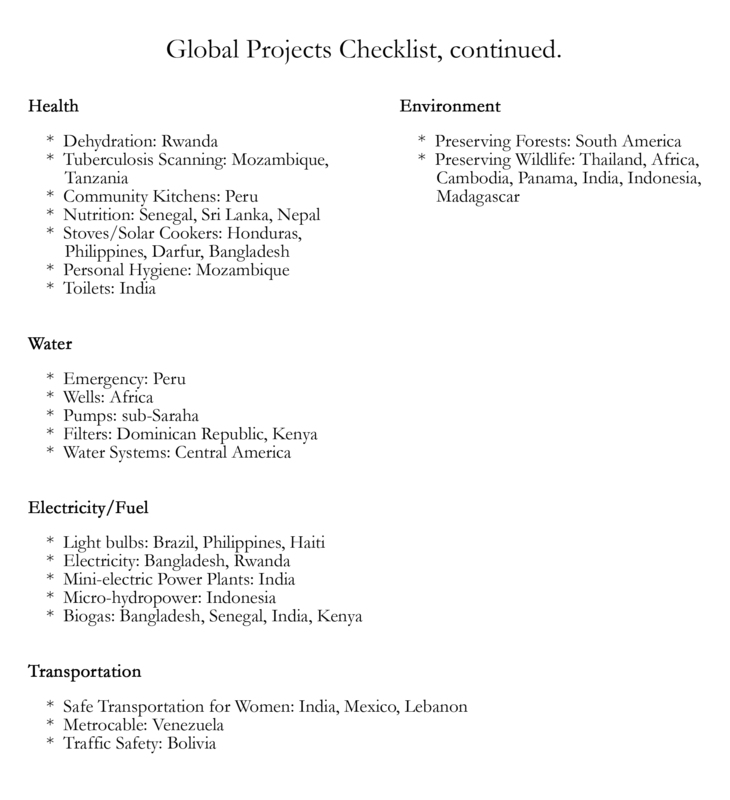 Similar to the national checklist, these projects can serve as an accessible resource as we adopt sister cities. Global projects address unique geographic and societal conditions in developing areas of the world that are, most often, distinct from our own communities. The checklist can be a research tool for students that creates awareness of a variety of needs and solutions while helping them find specific solutions for specific challenges. Students would communicate with peers nationwide engaged in sister-city projects in similar geographical areas of the world, sharing problem-solving approaches, models, and outcomes. Over time, they would link to their global peers in this dialogue and become a global generation of problem solvers. The projects above would increase in number as we organize in this work. Project originators in the global arena are current heroes in our world, our links to sustainable change in areas of great need. They are committed, long-term solution makers who pave a way that can be replicated or adapted. Their experience can help the education of our children. They can teach us to listen, to seek the input of others, to create lasting change that honors tribal custom or ethnic culture, and to support in sustainable ways. Our children, working with the guidance of project originators, can become a generation of heroes. The beginning topics in the global checklist offer many projects that address reconciliation, healing, and shaping views toward peaceful and productive coexistence. These projects inform us that as humans—as adults—we don’t have a track record for working together, living together, or solving problems together. We need to ask how we are addressing this issue in our children’s education. We need to provide them with education that teaches them how to come together to create a world better than the one in which we live. Experience with concepts of tolerance, diversity, and inclusion inform us we cannot assume what is best for another group of people from outside their daily living conditions, habits, customs, and history. We need to establish a dialogue and listen with genuine interest and respect to their perspective. Our children need to learn how to best to start a relationship with their peers in a developing area of the world. What are the cultural norms and considerations that are involved? What is the starting point for communication? What beginning need is most meaningful to our sister city? How could a possible solution be sustained by the population of our sister city over time? This information constitutes the preparation phase of the service learning structure that informs the action phase. I was introduced to a sister-city service learning project that drew upon these elements by Ken Sider, a third-grade teacher in our school district who introduced me to Ashok Mahaltra, a project originator and a professor at our local university. Ashok was born in India. When his wife passed on early in her life, he promised her he would build schools for the poorest of the poor in India and has done so through the Ninash Foundation, which he created in honor of his wife. He makes regular trips to India and has created trustworthy, efficient, local partnerships essential to project success in places far away. He builds on outcomes and incorporates new initiatives that continue to evolve. Ashok was our person “on the ground” who saw children picking up cow dung in the small village of Dundlod in northwest Rajasthan, India. These children were not permitted to attend school or drink from the same ladle with other children. He began to ask questions and seek solutions. Ashok sold a rental property in 1996 and used the proceeds to start the Ninash Foundation. The same year, in a one-room building donated by a local woman, 50 children began attending the first Indo-International School in Dundlod. The number of students attending grew to 150 by 1997. Another donated space accommodated this increase in students until the foundation gathered the funds necessary to build a school with six rooms in 2000. By 2006, the school included high school grades with science labs. As of 2012, the completed central school has twenty rooms and 550 children grades nursery through twelfth. After sixteen years, over a dozen of the school’s girls have gone on to college. The school is now one of the best in the state and also includes economically and socially upper-class students. As a service learning advocate, Ken Sider has experienced the increased student motivation and learning that results from student leadership roles in real-life contexts. Learning about the world and becoming an active participant are fundamental educational connects for him. Ken recognized the rich educational potential for his students if they were to learn about India and the work of the Ninash Foundation, giving them an opportunity to find their places in the global world through the context of contribution. In a K–12 service learning curriculum, students would get three years of experience with service learning leadership roles and projects by the time they reach third grade. Our students’ global peers in developing areas of the world have of necessity often taken on adult responsibilities by the same age. With this perspective, youth on both sides of the equation are ready to have a conversation. Youth worldwide need connection with their peers—those who will be their peers as adults. If our children take the lead, furthering the work of project originators, they will bring solutions to areas of need around the world and create relationships infused with appreciation and gratitude that grow among themselves as people who see human interactions in a different way than the previous generation does. Once a sister city has been identified, students learn about the geography, climate, government, art, and culture of their sister city, and learning genuine needs comes next. The need identified by our project originator was schools, but the starting point involved building relationships and trust. Children in undeveloped areas of the world often engage in menial tasks to help their families survive. Releasing these children for school requires the sacrifice of this precious income, the sacrifice of a known value for an unknown, and to trust that change will occur as a result of education. Building this trust and creating a shift of perspective among families is the work of a project manager in the sister city. A critical part of our students’ education is learning of this critical shift for families; they learn that relationship building comes before taking action, before the opportunity to affect long-lasting change. Once families in our sister city met with Ashok and became invested in the idea of education and schools, the need was to identify a beginning location, however makeshift from our perspective, to provide teachers and basic supplies and then build schools. Our students learn about the history of the Ninash Foundation; they learn that younger students began with writing on slate, which requires them to memorize as they learn, that their first activity of the day is yoga, and that students teach other children in their homes. Building communication and relations among peers typically requires preparatory thought and discussion. In the beginning, because the children in Dundlod were learning three languages, Hindi, Rhajistani, and English, English was still difficult. If each of our students sent a letter, the principal at the school would have to translate them all. Someone suggested a composite letter from each class or a power point presentation as a better way to communicate—perhaps once a month—using pictures and a few words that were fairly self-explanatory and helpful in developing language. As education progressed in our sister city, traditional pen-pal relationships in English became possible. Gathering children for education revealed the need for dietary support; proper nourishment of all students attending school was not secure. A kitchen added to the school in 2004 provided one nutritious meal for every child each day. Dairy goats became another solution: if each family got a goat, there would be an ongoing supply of milk, cheese, and yogurt for the poorest families of the children—families earning less than $1 a day. As the goats multiply, more opportunities for sustainable livelihood become possible. Sending items or ourselves to areas far from home is not cost-effective. Cash converted into goods and services on the spot is most often the most practical way to help. In the preparation phase, students and teachers plan community events, fundraisers, and informational campaigns to generate these funds. Fundraisers that demonstrate learning are the best fit for service learning projects. In our school district, students create a public fundraiser where they sell Indian craft items they have made and perform Indian dances and songs. On average, with 25¢ sales, they raise $500. If students learn about the art produced in their sister city, they can create items for sale such as bookmarks or stationery using indigenous techniques they have studied. If they learn about traditional foods from their sister city, they can try recipes and make recipe books for sale, create dishes for tastings, or contact restaurants to create these foods for a public event. If students learn about music and dance from their sister city, they can create a dance party around this theme as a fundraiser. A high school student from London, who had visited the Indo-International School in Dundlod, created calendars combining children’s art and life from Dundlod with children’s art and life from London. All proceeds from the sale of the calendars fund field trips for the children of the Dundlod School. Our students engaged in an interesting art project. Classes collected pennies while studying Rangoli, an Indian art form. Each class created an intricate Rangoli design on the cafeteria floor using pennies and invited all classes to the “Penny Art RangoliGallery.” One such event yielded $450, which went to the Indo-International School in Dundlod to buy pencils and replenish the school’s library. Students learned about past project contributions and accomplishments as well as current needs. T-shirts made each year can list accomplishments to date, creating a fundraising activity that celebrates the effects of sustained community building and students’ leadership roles in third grade. Another example in our schools is the “Adopt-a-Goat” fundraiser, created to provide goats for our sister-city community members in need of a sustainable food source. If a class raises $60, its teacher kisses a goat at a celebration assembly, providing a fun incentive for this particular fundraising effort. The Ninash Foundation arranges for the purchase and distribution of goats in Dundlod. Students and teachers who create new fundraising events based on learning about their sister city can add to an ever-evolving database of project components. Schools can submit successful ideas as well as draw on the work of others who have contributed to the database. Opportunities for reflection abound in a sister-city relationship as students share contrasts between the cultures, as cooperative work takes place, and as friendships form. Although third graders manage the sister-city project, older grades can contribute, expanding opportunities for learning, giving, and reflection. In an ongoing service learning project, everyone can share current and cumulative outcomes. Over the past six years, the fundraising efforts within our school district for the Adopt-A-Goat program have supported the donation of over 80 goats. Combined with donations from local residents in the sister city, the distribution of 200 goats has occurred. Celebration can happen at many points in a sister-city project: a fundraiser that educates, a T-shirt that honors work to date, a news article about funds raised at an event, a school wall design that tracks fundraising outcomes, and a national database of many sister-city outcomes. With a service learning K–12 curriculum in place, sharing sister-city outcomes at a school assembly is a natural occurrence as one of many school-based service learning projects. Connecting students at home and abroad increases awareness of the role education plays not only in the life of the individual but also in the context of the world. When our children discover the life-changing significance education can bring to a family or community in a developing area and the level of sacrifice often required to attain it, they gain a fresh perspective on education in our country. We need to develop our humanitarian outreach further, creating ever-deepening, constructive, peaceable connections with others worldwide. The sister-city component provides an ongoing, organized way for us to reach out in a sustained manner to developing areas of the world. If our youth come together worldwide to work productively for the best interest of all concerned, our view of what is possible will inevitably shift toward positive outcomes and hope for the future. If students maintain yearly communication, they could learn of the developing life goals of their sister-city peers and share perspectives on progress made at home and abroad. The concept of a nationwide graduating class would expand further to a global graduating class of young adults who have learned it is possible to work together based on their practical experience in making their world a better place; they will also have come to know a progression of solution-making that previous generations could not have envisioned. Addressing the variety of needs of community members challenged by disabilities requires community support beyond doctors and hospitals. Independent living centers (ILCs) provide skills training and resources to help people achieve self-determined living. Areas of support include adaptive technology, home modifications, independent living skills, personal care, transportation, education, and employment. Other integral considerations are networking, peer support, recreation, social interactions, and emotional support to combat isolation. ILCs work to educate and advocate for needed changes in society and to create a barrier-free society to support the greatest level of independence for all—an accessible community and equal rights in a context of unequal mobility. Service learning approaches to the topic of disabilities often incorporate some form of simulation or experiential component to increase understanding of the dimension of challenge posed by a disability. Equally important is real-life contact with people living with disabilities. From this combined perspective, accommodation, accessibility, and independence become more meaningful. Ken Sider developed the Disabilities Awareness project in coordination with Don Wyckoff, the architectural barrier consultant for the Catskill Center for Independence. All students get the opportunity to spend a day in a wheelchair from the moment they arrive until the end of the school day, except for bathroom breaks. Students complete a contract outlining acceptable behavior, engage in a prewriting exercise identifying what they think they will experience, journal their experiences, invent something to address a specific challenge they faced, and finish with a final essay. Together, students create a documentary video to support their advocacy efforts. Their teacher also commits to a full day in a wheelchair. A meeting with the ILC educator addresses the work of the organization, the range of disabilities, people-friendly language, and legislation concerning civil rights, discrimination, and accommodation. The ILC educator demonstrates how all parts of a wheelchair work: steering, locking, brakes, footrests, and traversing different ground surfaces and slopes. In addition to providing a parental permission slip, students sign a behavior contract that requires respectful behavior, cooperative work with classmates, and requesting help only if they cannot complete a task by themselves. Students also complete a prewriting assignment on what they think the wheelchair experience will be like. Along with the task list, the following questionnaire lays the foundation for a personal essay assessing a variety of factors encountered in the wheelchair experience. Details, complete sentences, and parental support are advised. Were you comfortable in the wheelchair? How did your body feel? What was the most difficult thing you had to do while in the wheelchair? What tasks were impossible to do without help? How did you feel about asking for help? How did students (other than your classmates) treat you when you were in the wheelchair? Was there ever a moment when you wished to be out of the wheelchair? When? Why? When you went to specials (PE, music, etc. ), how was it different? Was it easy or difficult to work at your desk? Why? Were you able to open doors? Was it difficult? Describe any challenges or frustrations you had at lunch. Describe any challenges or frustrations you had at recess. Did it take you longer to get things done while in the wheelchair? Share an example. If we had a disabled student with a wheelchair in our class, what changes should we make to our classroom? If you could build a better school, what changes would you make for disabled people? Have you changed the way you think about people in wheelchairs? If so, how? The preparation phase creates awareness of environmental elements not designed or maintained to support the needs of people with disabilities. The concepts of “accessibility” and “accommodation” gain context and become meaningful terms that inspire advocacy for corrective action. Using the Americans with Disabilities Acts Accessibility Guidelines for Buildings and Facilities (ADAAG) website, students determine on-site barriers to accessibility. Parking, exterior and interior paths of travel, ground surfaces, slopes and grades, level changes at doorways, door widths including latch-side clearance, door hardware, door pressure, door-pull force, hardware, table height, and reach height are assessed. Arm and hand strength, and dexterity are additional considerations. With this information, students create a report for school administrators on current conditions and solutions, noting violations of the Americans with Disabilities Act (ADA). Students participate in documenting their experiences in the wheelchair with camera and video: two students are videographers each day, and two students are photographers each day. The photos and video footage become an educational video that supplements the students’ presentation to school administration where they request answers for noncompliance. Although only a few people carelessly park in the handicapped space, students noticed it and purchased an additional sign to place beneath the handicapped parking space, indicating “No student drop-off or pickup; NO deliveries.” They also created “parking tickets” to remind violators. Extensions to reach high places, pencil sharpeners, cabinets, etc. When Larry asked students for questions, they were well prepared for meaningful dialogue. Be glad people look out for you. Be careful; think before you do things. Life can be hard for anyone; it’s all about positive attitude. It’s no fun to give up. Other people can give you ideas. Students accompanied him to his van, which he entered independently via a ramp at the back of the van. He moved to the driver’s seat and spoke with them from the window before leaving. During the Disabilities Awareness project, students experience more than physical navigation challenges. When accessibility is not possible, they experience the lack of integration and inclusion—the inability to participate that creates social isolation. These experiences motivate and inform their advocacy work. Students learn about the processes and skills that combine to create change in their world. Encounters with people who are meeting the challenges of living with disabilities can additionally inspire them to believe in their capabilities to meet their own challenges. All student essays get published in a special commemorative book. Sharing the project at an assembly allows younger students to anticipate and older students to reflect on their encounters with disability. Our local ILC offered a pizza party to thank the students for their work. The students chose instead to put the money that would have been spent on the party into an account that would be used for future accessibility projects. The ILC also donated an item the students had identified in their project work: an accessible doorbell for the main entrance to the school. Two college education majors adopted the project at our local university, compiling photos and data on the condition of the “accessible campus.” Their presentation for deans, professors, and assorted staff produced great response and prompted repairs around campus. Since then, these students have presented the project and outcomes twice a year to other education majors. The project has been adopted by schools in Alaska, New Jersey, Pennsylvania, Rhode Island, and Texas, affecting approximately 1,500 students. Local ILC staff identified a significant need: to boost the employment rate of young adults with disabilities in our community. The framework for a possible middle school service learning project to address this need follows. Staff from our ILC talk with students about the current high unemployment rate after graduation for those with disabilities in our community; students learn that the ILC needs support to help students with disabilities prepare during high school for the transition to employment. The suggestion of the ILC staff member was to create lifelines of people with disabilities who are or were successfully employed and how they achieved this. Inspirational quotes could be included. The purpose is to provide inspiring examples to students with disabilities in middle school and help them identify employment goals and structure their studies through high school to achieve their goal. This provides sufficient time to develop skills and to give focus to their work leading to graduation. Our ILC educator could help identify successfully employed individuals with disabilities from the community for middle school students to interview. If this project were part of the K–12 service learning model, students nationwide could add local research to a national pool of information. This larger body of examples could then be broken down by specific disabilities. The local ILC educator could then direct students to gather examples of specific disabilities based on current needs in the community each year, thereby increasing relevancy. Student reflections on this project would build on their reflections in the Disabilities Awareness program. Student-created lifelines could be posted on a bulletin board and, afterward, be given to the special education department for ongoing use. A school-wide assembly, perhaps during Disabilities Awareness Month, would provide opportunity to honor those interviewed, supporting the integration of people with disabilities into the larger community. In an ongoing service learning curriculum, students with disabilities could look forward to be honored as they work toward successful employment after graduation. Other projects under the topic of disabilities in my database explore blindness, deafness, and physical conditions related to aging that require problem solving and adaptation. There are models for buddy relationships based on tutoring, assistance with living and work-related skills, and physical education. Certain projects foster inclusion in activities such as cheerleading, proms, and programs in music and dance that draw out creative expression. We face many environmental challenges, and while some areas of problem solving may still involve debate regarding best solutions, other areas, such as recycling, are more straightforward. Although many of us are demonstrating progressive awareness that a piece of trash may require assessment to determine its category and destination, we have to make much more progress. If we gather progressive models, we can begin to address the issue of waste in a more comprehensive manner. If we bring these models to our schools and the education of our youth, the greatest influx of change will occur as they bring awareness and improved habits to their homes and communities. We can create a K–12 service learning community leadership role for recycling, managed and tracked by sixth graders, that educates and promotes lifelong habits of recycling, which will strengthen progressive care for the environment among us all. Many schools have already begun significant work in addressing school waste with their students. A common starting point in schools is analyzing existing waste by collecting, weighing, and examining a day’s worth of garbage, which creates a base line from which to monitor progress over time. Students identify categories of waste and seek ways to recycle and reduce waste. Once they determine a course of action, they get the supplies they need and inform the school community of the new systems and processes. Students have created skits to teach recycling information to their peers, infomercials on waste-free lunches, environmental rap songs, posters, and bulletin boards with reminders and tips. As students track their progress, their daily contributions accrue to contrast with their beginning waste data. The significance of these results would compound if schools tracked their progress in a common database. Students who bring lunch from home can make it waste-free by using reusable lunch bags and containers. Foods such as apples, oranges, and bananas become healthier alternatives to packaged snacks. Cafeteria food service in schools pursuing reduced waste may opt for flatware instead of plastic utensils, family-style dining and/or compostable salad bowls. Students dump any leftover milk and place their cartons in a recycling bin. Organics become a separate waste stream. Some schools send organic waste to composting facilities or farmers for composting or feed for pigs, creating significant reduction in hauling costs. Other schools take advantage of the educational opportunity provided by vermiculture—worm composting. Students in these schools become involved with classroom worm bins, creating compost for school gardens or for sale. Food service may join in with composters in school kitchens, adding to the supply of compost for school gardens. Digging deeper into the cycle, some students in our country have school gardens in which they raise food for their cafeterias. Students who engage in this full cycle of growing and tasting their own food become more sensitive to the amount of effort it takes to grow it. The administrators of such programs typically find them to be cost effective, as produce is sold to the school. The bridge to environmental science is strengthened in schools that have teaching gardens, green roofs, and rain barrels to recycle water. Although the emphasis of this writing is on a K–12 curriculum, our college and university communities increase our store of models. Universities and colleges in Illinois, Vermont, and California have either herds of cows producing all their milk, yogurt, and sour cream, their own hens for cage-free eggs, their own apple orchards, or their facilities management vehicles running on dining-hall cooking oil. These advanced-learning environments continue to design progressive models for our communities. All these examples from our schools represent pieces of what could become a collective, comprehensive model disseminated nationally for work in all K–12 schools, bringing the best of all solutions together for all our youth and our communities. Programs often pay for themselves, and hauling costs can go down. Even more far-reaching are the benefits of experiential learning and instilling progressive habits among our youth—the influx of health as our children get more-natural produce and new foods to explore because of their labors and education. Overall morale typically increases among staff, teachers, and students with the adoption of these community-building programs. The schools in my database with the components above are in California, Colorado, Illinois, Maine, Maryland, Missouri, New Jersey, New York, Ohio, Vermont, and Ontario. Model community programs have developed in a variety of locations nationwide. If we were to bring these models to the national checklist of projects, to the attention of our children, and to the attention of our community members, we could gradually adopt and create processes for recycling different categories of waste, with the support of others who have already done so. Community members and committees could turn to a national list of projects to learn how others have solved a particular problem rather than wasting time or momentum wondering how others have done so. The optimum goal for all, over time, would be zero waste. 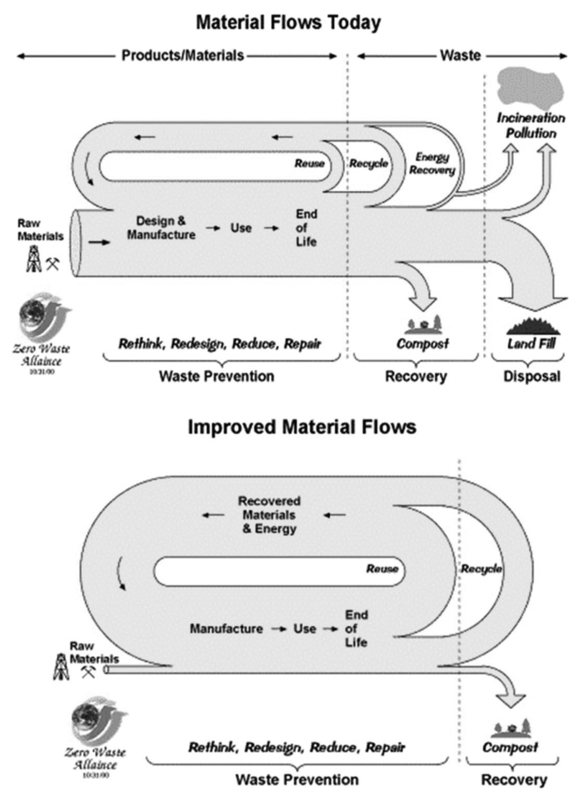 There are several approaches to assessing waste streams. When we have an item that we categorize as trash, we can check it against the national checklist to see how others are recycling it. We can assess community businesses by type, using model programs for specific businesses. We can assess products we purchase to determine the complete life cycle of the product in relation to the concept of zero waste. States from my collection with components to contribute are California, Florida, Georgia, Illinois, Indiana, Maine, Massachusetts, Michigan, Minnesota, New Jersey, New York, Ohio, Oregon, Pennsylvania, Vermont, Virginia, Washington, and Wisconsin. Textiles are one category of waste. Beyond reuse as second-hand clothing, textile discards can be converted into fiber for use in new textile products or for wiping and polishing cloths. Worn-out sneakers can be ground up to make sports surfaces. Scrap tires are becoming fill material in road and building projects, for playground pads, and tire-derived fuel. Building materials are another category. Deconstruction models call for reusable material from demolition sites or homes under construction to go to construction-supply recycling organizations where contractors and others buy them. Homeowners and private contractors can also donate to these organizations. Construction and demolition recyclers handle items such as wood, brick, concrete, roofing shingles, and metal. Wood not suitable for reuse can be cut into firewood and kindling. Different collection models abound in our communities. Waste haulers may provide organics carts for pickup every week on trash day. Some communities sell backyard composters, and others subsidize the cost of home composters. Some communities include yard debris with compost collection; others separate these two categories of compostable material. Cities may own a compost site that sells compost and mulch. Yard debris can be collected year-round or seasonally. One community collects fall leaves curbside, mulches them, and delivers the mulch to residents free of charge. Some cities have over twenty categories of “waste” for recycling. Some models have drop-off stations; some pick up over twenty categories of recyclable materials weekly. Some sort glass by color to save the cost of an intermediate processor; others have online guides with search options for instructions and information on recycling specific items. “Discard malls” allow businesses that recycle and consumers to drop off unwanted items. Some have an area of a recycling center where reusable items such as furniture, books, and clothing are available for free to residents. Some cities have for-profit centers that include repair and refurbishment of items for sale. There is even a recycling incentive program to stimulate more recycling: recyclables get weighed on pickup, and based on the weight, those bringing the recyclables get reward dollars good at stores and earth-friendly product discounts. With a list of specific categories or items that communities are recycling nationwide, we can check off the things recycled in our own communities and seek models from others for the things we do not currently recycle. With a checklist managed in our schools, we would not need to educate our children about recycling, as they would be partners in promoting improvements and managing information regarding recycling in their communities. Businesses generate different kinds of waste based on their products and activities. Models from businesses engaged in exemplary recycling programs can support us in bringing solutions to our community businesses. Some food service models compost 100 percent of food discards from kitchen and dining rooms. Rendering companies pick up meat products and kitchen grease. There are models for hospitals, shopping malls, fairgrounds, festivals. Some correctional centers turn mattress cotton into a compost bulking agent. Some grocery stores take old flowers and greens from floral departments, waxed cardboard, preconsumer scraps from in-store cafes, wilted and spoiled produce, and corrugated cardboard for composting. In one grocery store model, organics that include spoils, out-of-date bakery, dairy, and deli items, old seafood, soiled paper products, and food spills go into waxed cardboard boxes and get compacted. A hauling company takes the compacted organics to a composting site where they are ground with yard trimmings and composted. The nutrient-rich finished compost is screened to remove contaminants and sold to farmers, golf courses, and land reclamation projects. This information can raise awareness in our schools and beyond. As we build a K–12 service learning model, the parents and relatives of our children become involved—they are doctors, nurses, grocery store managers, business owners and their staff, and extended family members. When we know how specific businesses are accomplishing replication-worthy results, we can suggest solutions or components of models along with contacts for additional support. With a checklist managed by schools, the trickle-down effect into our communities could happen in a number of ways. For example, some doctors’ offices and hospitals recycle outdated X-ray film. Maybe doctors, nurses, or hospital staff members take their children to school and look for model practices under hospitals on the national checklist of projects. They could take a question to their staff or inform the school that their workplace does in fact recycle such film, and sixth graders could update this information on the community checklist. A checklist prompts us to ask and not assume as we update our community information. Students and others might ask their dentists if they recycle X-rays. If not, they can connect the dentists with organizations that do so. People could then read a list of dentists who are recycling and notice theirs is not on it. A simple phone call can help students update community information. We should applaud the efforts of our hospitals, doctors, and dentists who are recycling. With models and resources that instruct, we are better able to make changes and take collective pride in the progress we make. As our youth interact with businesses, they will learn best practices that will influence their choices in the variety of occupations they will hold as adults and bring wonderfully improved habits to the workplace. A nationwide education model secures the integration of these habits among all of us. As we develop the habit of recycling and considering waste as resource, we will consider the waste-stream outcomes of the products we buy. Instead of waiting until an item is no longer functioning to wonder how we can dispose of it, we can begin at the beginning—before we even buy it. Many times I have found myself with questions about replacement parts or ingredients when shopping and used my cell phone to call the company—either in an aisle as I assess a product or in the grocery store line. This immediate feedback to companies helps inform their decision making for the manufacture of their products. What is important to consumers is important to manufacturers. As our youth grow in understanding and working with the zero-waste concept, they can better consider the design of the entire life cycle of a product: can it be reused, recycled, or composted easily when the user finishes with it? Our youth will come to see that waste is actually bad design—the result of bad decision making. As they assess the full life cycle of products, they may begin to question whether they really need a product. As chemical waste comes to their attention as an element of our waste stream, they may search to discover the role toxics play in production. Shipping distance and packaging become further considerations. End-of-life industry responsibility for products and packaging is an important objective in achieving the goal of zero waste. We can grow a generation of adults who are so well versed in the basics and habits of recycling and goals of zero waste that they demand the cooperation of businesses and manufacturers. These young people will eventually populate our management positions and bring greater awareness from an educational foundation that embraced many service learning leadership roles and contexts in their communities and sister-city relations. Our youth will gradually unite worldwide to address a multitude of overlapping issues that will inform their decision making at the personal and local level, with awareness of the refractions of their actions at the national and global level. Our youth may become advocates who help curb excessive consumerism and encourage their parents to purchase, as financially possible, more-durable and repairable products. Our youth will ask questions that we may not be able to answer; they will not be satisfied with complaints or explaining why problems exist. They will seek solutions or solution makers and take action; they will want to do better together as a generation that rises above the performance of past generations. They will seek solutions as a direct result of their educational involvements in their communities. Expectations and inspiration will rise as solutions become tangible. In such an evolving context, companies may respond more quickly to a changing market with modular designs to upgrade complex products or by leasing some products with full-service guarantees instead of selling them outright; responsible usage replaces ownership. Youth with comprehensive service learning experience will gradually enter fields of product design and manufacture. They will notice improvements they can make, be mindful of long-term solutions and planning, and incorporate environmental stewardship. Their scope and interests—their goals—will be larger than the realm of company profits. As our youth organize and handle community information against a backdrop of nationwide models of excellence, they will take pride in their roles and contributions; they will see progress in which they have been involved and evidence of their work in the community and nationwide. Our children will become communicators, information seekers, and disseminators. If they get the opportunity to work with us as they grow, they will continue to work with us. If they are involved in constructive work with their peers as children, they will continue in constructive work with their peers as adults. With an experiential leadership component threaded constructively throughout the grade school experience, students who enter middle school will be decidedly different. They will bring an authentic desire for education that continues to include opportunities to use their knowledge and abilities in ways of value to others. Having a track record of making a difference and a national checklist of projects, our students will be able to make decisions about their next projects. Teachers can opt for projects that reflect content alignment with their specific disciplines. Students emerging from this grade school foundation of service learning will have communicated with their peers nationwide and globally and seen the outcomes of their combined efforts. They will have seen solutions begin to form in developing areas of the world and the markings of peaceable, productive relationships evolving from nationwide outreach. They will know that younger students sustain and develop the leadership grade school projects in which they engaged. The goal as we build through these middle and high school years will be to maintain continuity, providing progressive layers of service leadership work for our emerging young adults. Freerice.com is a website that utilizes multiple-choice exercises to strengthen a variety of academic subjects. Rice is donated to developing nations through the United Nations World Food Program (WFP) based on correct answers. Visit poverty.com for class discussion. Visit thehungersite.com to donate a cup of food to an impoverished person. Then go to freerice.com to engage in progressive skill building in areas such as English vocabulary and grammar, humanities (famous paintings and literature), chemistry, human anatomy, geography (flags of the world, countries, world capitals, landmarks), math (multiplication table and prealgebra), languages (German, Spanish, French, Italian), and SAT preparation. Success in these skill-building areas generates rice to support the global need for food. Write a personal reflection on global food insecurity, drawing on sister-city information and community efforts to address local food insecurity. Total rice donations and scores in academic areas on freerice.com can be shared in a school-wide assembly and with the community. The inclusion of statewide and national outcomes could expand recognition that we are a powerful force for good when we work together. Fifth graders would add these global food donations statistics to a graph that represents total food donations from the community. In a grocery store food-garnering service learning model, students get a specific shopping list from the food bank and create a check-off list of needed items that can be displayed at the grocery store entrance. Community members would check off their donations to reflect new quantities needed. Information about how food insecurity is being met, along with the fifth-grade graph, would be posted in this location. The grocery store could donate any frozen or dairy items reaching their due date, thereby reducing organic waste and hauling costs for the store. Students transport all donated items to the food bank each week and stock the shelves. They would also organize volunteer support to maintain the project during vacations. Certain restaurants and food service companies regularly donate excess food to food banks. Older students can develop communication and presentation skills through advocacy work with community restaurants to bring them onboard with this natural opportunity to give back. Restaurants already engaged in excess food donation can help other restaurant owners see how some in the industry are accomplishing this much-needed community contribution. Students would share information with restaurant owners to create more ongoing partnerships between local restaurants and food banks. Volunteer transport is the other project component students could coordinate. Local businesspeople or restaurant employees often find this volunteer transport role adds a valuable and convenient service component to their lives as they can drop off food at the food bank on their way home from work. Students could create and maintain volunteer support information. City Harvest of New York City has a “street fleet” of corporate volunteers who help capture the small amounts of food that would not be cost-effective to pick up with larger trucks. Our students could learn, through a national checklist of projects, of communities managing transport challenges along with setup specifics. In a nationwide K–12 curriculum, over time, everyone would become familiar with these programs and how they work. As grocery stores and restaurants get on track to donate excess food, their donations are acknowledged in updates from the food bank and represented in fifth graders’ graphs. When the food bank began sending donation statistics, they also included a dollar amount for tax credit. The director of the food bank explained that there could be tax credit for donations from for-profit restaurants and food service companies. A fuller cycle of giving thus presented itself: what if the for-profit food service in our public schools had given leftover frozen foods? They could have received a tax credit, the dollar amount of which could have been donated to our youth for more service work. What a wonderful cycle among us all, with the added benefit of free marketing for the food service not only to parents but also to the next generation of adults coming to know of their good work in giving back to the community. It would cost them nothing. The realization of this fragment of potential would provide students with some extra funds for use in their service projects. Restaurants and grocery stores that donate excess food could also pass these tax savings on as donations to youth actively involved in bettering their communities. Reflection is one of the four components of service learning. A K–12 service learning curriculum that spanned multiple needs and approaches to community problem solving could include an ongoing journaling component sustained from kindergarten through graduation. Reflections could be stimulated from a variety of perspectives, creating a record of contributions to local, national, and global needs throughout the entire K–12 education. Students could draw comparisons and discover overlaps, commonalities, and distinctions between the different areas of community service work in which they have engaged. These journals would capture all service components in one document that students take with them upon graduation, providing evidence they were able to take actions that bettered their world. It would show that they always had a place in their communities, their country, and the world and that they took responsibility for something beyond themselves in partnership with their local, national, and global peers. A K–12 journal becomes a piece of personal and community history, a history of growth in leadership, a history of progress in different areas of problem solving, a history that coincides with their nationwide graduating class, and a history that overlaps with their peers in surrounding grades. The journal is a way to remember and share stories and differences with future generations of youth who can see the foundation they laid or upon which they continue to build.